EF Technology® is a process that uses alternative cementitious materials that results in the reduction of greenhouse gasses. This resource saving process not only produces greener and more sustainable concrete mixes, but also stronger and more durable concrete products. Our core business strategy is centered around providing green concrete products that conserve energy resources, reduce pollutants, and bring green foundations to all type of concrete constructions. Through EF Technology, we are at the forefront of the market transformation towards green building, paving the way for a greener future. Portland cement, an essential component of concrete, is the glue that binds concrete together. In recent decades however, the production of cement has been designated as a major greenhouse gas pollutant. Worldwide, the production of Portland cement alone accounts for some 5% of human-generated carbon dioxide (CO2), the greenhouse gas most attributed as the source of global warming. CO2 derived from de-carbonation of limestone. CO2 from kiln fuel combustion. This does not account for the CO2 associated with electric power consumption, since this varies according to the local generation type and efficiency. Typical electrical energy consumption is of the order of 40-45 kWh per ton of cement produced. 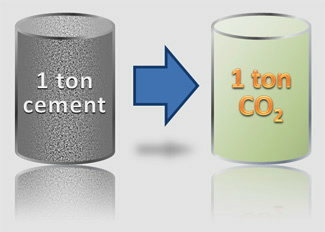 As a result of these measures, the general rule is that the creation of one ton of cement releases one ton of carbon dioxide into the atmosphere. To combat this problem, there are a number of methods and technologies now available from U.S. Concrete across the United States that provide a multitude of environmentally friendly solutions (called EF Technologies). Among these is the use of alternate or supplementary cementitious materials (SCMs) such as fly ash and slag. Fly ash (also known as a coal combustion product or CCP) is the mineral residue resulting from the combustion of powdered coal in power generating plants. 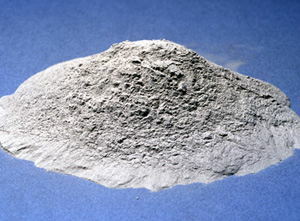 Fly ash consists mostly of silicon dioxide, aluminum oxide and iron oxide. It is pozzolanic in nature, meaning it reacts with calcium hydroxide and alkali to form cementitious compounds. Most power plants are required by law to reduce their fly ash emissions to less than 1 percent. The remaining 99% is collected using electrostatic precipitators or filter bags. Initially, this collected ash was disposed of in ash ponds or landfills. Once its pozzolanic properties were discovered, however, it became useful as a replacement for Portland cement in concrete. Fly ash can replace up to 50% of the Portland cement required to manufacture concrete. 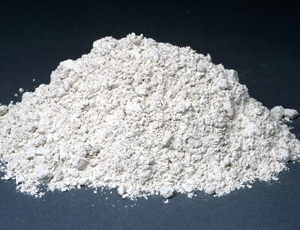 Fly ash can be used to improve workability and pumpability of concrete. Due to its generally slower rate of hydration, fly ash also lowers the heat of hydration and is important in mass concrete structures, such as large foundations, bridges, dams and piers. High fly ash concrete exhibits less bleeding and shrinkage than straight cement mixes. Fly ash is also used as a component in the production of flowable fill, which is used as self-leveling, self-compacting backfill material in lieu of compacted earth or granular fill. More and more fly ash is being used beneficially as a recycled material, although it is still far from fully utilized as more than 65% of fly ash produced from coal power stations is disposed in landfills. This amounts to approximately 40 million tons of fly ash in the United States. Slag is the by-product of smelting ore to purify metals. In nature, the ores of metals are found in impure states, often oxidized and mixed in with silicates or other metals. During smelting, when the ore is exposed to high temperatures, these impurities are separated from the molten metal and can be removed as slag. Through determining its many uses, it was found that ground granulated slag reacts with water to produce cementitious properties. It could therefore be used in concrete, in combination with Portland cement, as part of blended cement. Concrete containing ground granulated slag develops strength over a longer period, leading to reduced permeability and more durability properties. Since the unit volume of Portland cement will also be reduced, concrete is less vulnerable to alkali-silica and sulfate attack. As with fly ash, processing blast furnace slag into slag cement or slag aggregate eases the burden on our environment in a number of ways. It reduces the air emissions at the blast furnace as well as the material in landfills. Most significantly, slag decreases Portland cement usage by as much as 50 percent, thereby diminishing CO2 emissions. Typical mix designs for structural or paving concrete normally use substitution rates between 25 and 50 percent; high-performance and mass concrete applications can use substitution rates up to 80 percent. As stated earlier, approximately one ton of CO2 is released for every ton of Portland cement produced. 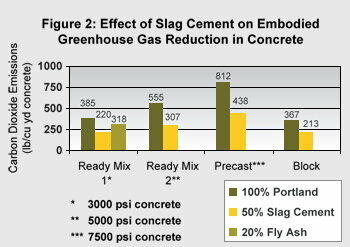 Figure 2 illustrates the benefits of substituting 50 percent slag cement in various concrete mixtures. Between 165 and 374 pounds of CO2 are saved per cubic yard of concrete by using a 50 percent slag cement substitution, a 42 to 46 percent reduction in greenhouse gas emissions. Slag cement requires nearly 90 percent less energy to produce than an equivalent amount of Portland cement. Reducing the use of Portland cement in concrete by substituting a portion of it with slag reduces the embodied energy in a cubic yard of concrete by 30 to 48 percent. Raw materials for Portland cement are gathered through mining operations. A ton of Portland cement actually requires about 1.6 tons of raw materials. Substituting 50 percent slag cement can save between 281 and 640 pounds of virgin material per cubic yard of concrete.